As part of Global Entrepreneurship Week, we are delighted to announce our forthcoming event, “All about Arts & Crafts/ New online platforms for sales and collaboration” which will take place on 25th November between Dialogue Cafe Amsterdam and Rio de Janeiro. By invitation of Dialogue Café Rio the artisan, design consultant and researcher, Claire Santanna Freeman, will be discussing the challenges for sustainable development of artisanal products in Brazil presented in her book “The productive chain on the Economy of Arts & Crafts in Brazil” (to be published in December) and her last findings in the field of fair trade, sustainable and solidarity production and retail. Claire S. Freeman, creative producers of handcrafts in Amsterdam and experts that know everything about sales and collaboration platforms like etsy.com and fablab.org will talk about handcrafts and creative ideas to produce, sell, collaborate and work with sustainable resources. Doors open at 3.45pm and drinks after the event from 6pm to 7pm. Her book, winner of the Brazilian Association of Cultural Managment monograph thesis 2010 contest, discusses artisans, artisanal product and consumer relationships; discusses Arts & Crafts, Cultural Management, Cultural Economy and Solidarity Economy concepts; presents contemporary democratic possibilities for artisans participation in Brazilian Public Politics; describes Arts & Crafts Economy´s productive chain phases and its presence at the World Wide Web. Through an analysis and statistics research of the decade that ends in 2010 and an experience on teaching and consulting services (2006 to 2008) the present study objectives are: serve as a base for Artisans e Cultural Managers on their search for democratic and sustainable solutions that will benefit these small producers; serve as an aid on planning integrated actions with, directly or indirectly involved, partners on this productive chain; contribute to this particular economy field that lacks with theoretical material approaching the various relevant questions here presented and finally propose a Solidarity Artisans Net Management Model. spans the globe with buyers and sellers coming from more than 150 countries. Etsy sellers number in the hundreds of thousands. make almost anything’. It’s an abbreviation of Fabrication Laboratory. cooperates with cultural, public and private parties. 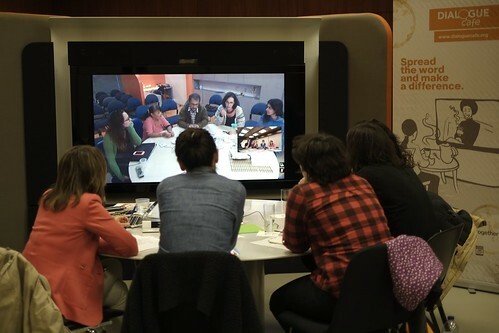 Dialogue Café uses state of the art video conferencing technology to enable face-to-face conversations between diverse groups of people from around the world so that they can share experiences, learn from each other and work together to make the world a better place.